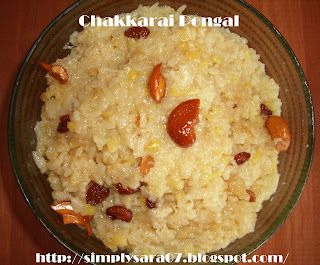 hi sara, Happy pongal to u...tom i will come to ur home for lunch okva?? Superb dear, but it is not lunar eclipse, instead it is solar eclipse between 11am to 3pm. Hi Friends, Thanks a lot for your wishes. Hi Rekha, You are most welcome. Happy Pongal to you too, the bowl looks super delicious. Happy Belated Pongal! Hope you had a great time! Pongal greetings to you Sara!